A baby woolly rhinoceros, dubbed “Sasha,” has been recently unearthed in Russian region of Yakutia, becoming a sensation for paleontologists. 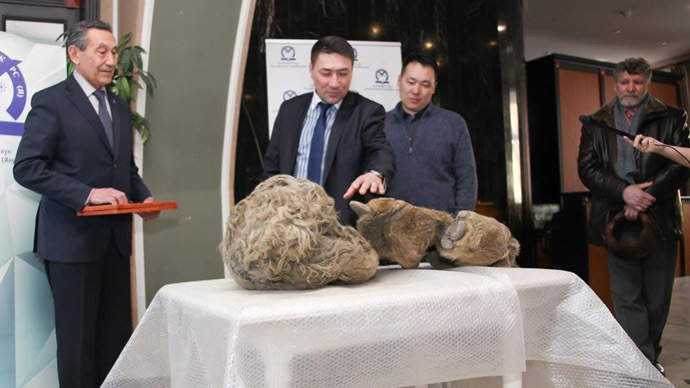 The remains of the extinct creature – a particularly rare and historic find due to its age – were handed over to the Academy of Sciences in Yakutsk, the capital of the Sakha (Yakutia) Republic, on Wednesday. The baby woolly rhino was found last September by Aleksandr Banderov, a hunter and businessman, and his friend, on the right bank of a stream flowing into the Semyulyakh River. The cub’s skull and face is quite clearly visible, and an ear, one eye, its nostrils, and teeth are in good condition, as well as the wool. The remnants of two horns were also found, though the carcass, that weighs about 60 kg, was half gnawed. Now, Russian scientists will try to extract DNA and conduct certain tests to find out the exact age of the cub and the date it died. “If the adult's morphology is known, we know nothing about the children. So far we have even not come across teeth, and now we have a skull, head, soft tissue, teeth, hopefully, in good condition at our disposal. First, of course, we will watch DNA, because the object is not thawed and it is quite possible its DNA preserved better than the previous findings' one. I think we can tell about the first results in a week or two,” said Albert Protopopov, the head of the Mammoth Fauna Department of Sakha Republic Academy of Sciences. The woolly rhino, which is believed to have become extinct around 10,000 years ago, was common throughout Europe and northern Asia during the Pleistocene epoch. Though surviving the last glacial period, the species could have died out due to the climate change or hunting by humans. That is why the discovered remains are at least 10,000 years old. The scientists have also estimated that the cub was about 18 months old when it died. In the 21st century, there was only one time, in 2007, when a frozen carcass of a grown-up woolly rhino was found in Yakutia. Mummified woolly rhinos were found throughout the 20th century, but they were “not usable for studies,” according to Protopopov. Another two mummies of adult rhinos were found in Poland’s Krakow and Ukraine’s Lvov. In general, woolly rhinos are less studied than mammoths, and their cubs are even less known to science. Russian and foreign scientists involved in the research hope that “Sasha” will help shed some light on the conditions these animals lived in. The first results are to be reported in a few weeks, but a more thorough analysis could take up to six months. “Sasha” was named after Banderov, who found it and handed over to the Sakha Republic Academy of Sciences.